Do you want to help us spread the word about DSEI? We need people to get active in their local area, and encourage people to join the protests. Check to see if there’s a public workshop planned near you on our events page, and you can order flyers and resource packs to run stalls in your local area to help spread the word by emailing info(at)stopthearmsfair*org*uk. 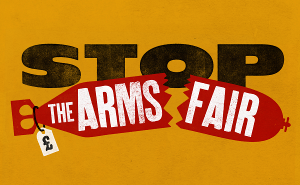 Book a speaker or workshop on the arms fair for your group by emailing info(at)stopthearmsfair*org*uk.